Making BBQ Brisket for your family and friends is easy, no fuss, thanks to the slow cooker. This beef brisket tender and delicious. Spray inside slow cooker with cooking spray. In small bowl, combine salt, pepper, garlic powder and chili powder. Drizzle extra virgin olive oil over brisket. 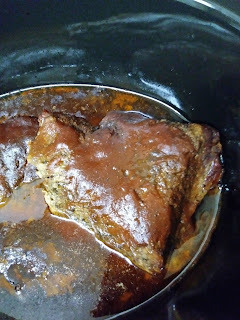 Rub spice mixture all over brisket, and place brisket in slow cooker. In separate bowl, combine bbq sauce, worcestershire sauce and water. Pour over brisket. Cover, and cook on low heat, 6 to 8 hours. When brisket is cooked, transfer brisket to cutting board. Let rest 15 minutes before cutting. Slice the brisket against the grain, making thin slices. Add additional bbq sauce, if desired. All I need is mash potatoes and a fork.